Set in the land of the Samburu people, this pocket-sized game reserve enables you to experience everything that is best about the burning semi-deserts of the NFD – the Northern Frontier District, as this wildly beautiful and mountainous province used to be called. Samburu lies on the north side of the Ewaso Ng’iro, whose coffee-coloured waters sustain the animals through the dry season, and from here you can also go game-driving in the Buffalo Springs reserve on the other side of the river. Elephant, buffalo, lion and leopard all come to drink under the graceful doum palms and shady riverside acacias, together with the animals unique to northern Kenya that make up Samburu’s “Special Five”: Grevy’s zebra, reticulated giraffe, beisa oryx, gerenuk and Somali ostrich. Like the Masai Mara, this popular reserve has too many lodges for its own good. Elephant Watch Camp, presided over by Saba Douglas-Hamilton, leaves the lightest footprint. Samburu National Reserve is one of my favourites. I love the arid, harsh environment, home to many dry-country specials like the funny looking gerenuk which can often been found standing on its hind legs to browse, the big Grevy’s zebra and the Beisa oryx. There are many specials on the birding front as well like the beautiful vulturine guineafowl and the Somali ostrich. Not as good for cheetah and lion as the Masai Mara, but leopards are easily seen. Late afternoon is my favourite time when silhouettes light up against the kicked-up dust. At this time the red soil and everything covered by it, like the elephants after a good dust bath, just glows. Like the Maasai, the Samburu people have lived alongside wild animals in this part of the world since ancient times. A visit to a Samburu village is highly recommended. Located in Kenya’s hot and arid northern region, Samburu’s life source is the Ewaso Ng'iro River, and the combination of near-permanent water and forest shade on the banks draws plentiful wildlife. On my game drive along the river I spotted some species rarely seen in milder climates including a long-necked gerenuk, the antelope that stands on its hind legs to reach foliage, Grevy's zebra, with its finely defined stripes and bushy mane, and reticulated giraffe, with its handsome jigsaw pattern. I also watched a couple of lionesses pad across the sandy floodplain for a quenching drink in the shallows, ever-watchful of the especially large crocodiles basking in the sun. Samburu’s birdlife was prolific too, and included martial eagle, pygmy falcon, and several species of hornbill. Safaris can be rewarding, although some may find the dry heat oppressive, but nevertheless Samburu has a good choice of comfortable lodges for a remote region, which provide a welcome respite from the equatorial sun. Buffalo Springs National Reserve lies just over a bridge on the southern side of the river and Shaba National Reserve is a relatively short drive to the east, so combining a safari with game drives in all three is an excellent and varied option and makes the long journey from Nairobi all the more worthwhile. 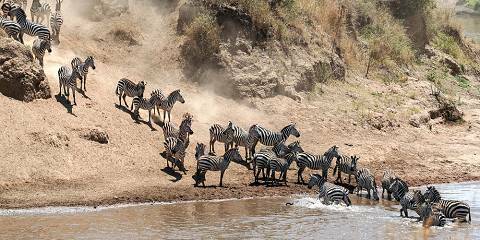 Set in the arid northern badlands of Kenya, but bordered to the south by the perennial Ewaso Nyiro River, this park is particularly appealing to us experienced safarigoers, since it protects several dry country variations on more familiar and widespread species. 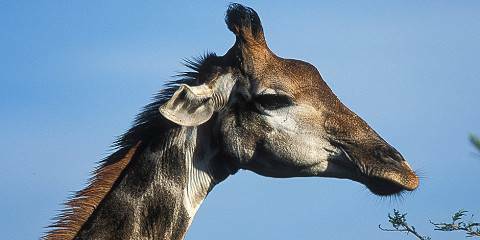 Reticulated giraffes rather than the more blotchy southern race. Grevy’s zebra, which is larger and more narrowly striped than its southern cousins. There’s also the stretch-necked gerenuk antelope, the striking Beisa oryx, and a race of Grant’s gazelle with such large horns you fear they might overbalance. It is also a great place to look for the normally elusive leopard and localised striped hyena, and home to plenty of elephant. It is also one of my favourite birding destinations in East Africa, home to a wide array of dry country specials, from Egyptian vulture and vulturine guineafowl to red-and-yellow barbet and various sparrow- and social-weavers. Like Meru, which is situated a little to the southeast, Samburu receives far fewer visitors than the better known parks in southern Kenya. However, it has several safari camps, making it a good choice for those wishing to immerse themselves in the wilderness as fully as possible. This part of Kenya is very dry, but the Ewaso Ngiro River cuts through the sandy landscape, drawing a good variety of animals and birds. Elephants are plentiful near the river and I saw much evidence of their tendency to trash trees in the nearby woodland. The herds have been the subject of detailed research for many years. I also saw lions at Samburu, along with plenty of zebras, giraffes and raptors. Samburu is often considered to be a poor substitute to the more famous parks of southern Kenya. This is not a realistic outlook though: not only does this great Northern Frontier District wilderness manage to avoid the crowds and tour buses of the south but it is also extremely rich in wildlife (and some would say that it is even more spectacular as predator territory). I stayed for 10 days in Samburu area but in the course of just two memorable days I saw five lion, two different leopard and a pack of 13 wild dogs. The ‘Samburu Special 5’ (Grevy’s zebra, reticulated giraffe, Beisa oryx, Somali ostrich and gerenuk) can be an exciting alternative wish list to the more hackneyed Big 5 and if you get a chance to visit a traditional Samburu manyatta you will find that these tough desert pastoralists have a unique culture that is actually far removed from the traditions of their more integrated Maasai cousins. Located in northern Kenya, in the land of the nomadic Samburu people, the hot and arid hills and plains of this national reserve are home to rich and varied wildlife, including lion, leopard, cheetah, distinctive Grevy’s zebra, reticulated giraffe, hippo, crocodile and wild dog. On my last visit, elephants provided the biggest show: we saw several herds, including one bathing in the river with extremely photogenic infants in tow. Because of its location, the park doesn’t get too crowded and the accommodation options all feel secluded and special. Most magnificent is the luxury Elephant Camp – a beautiful eco-friendly place on the riverbank, whose recycled wood dwellings blend effortlessly with the surroundings. I stayed at one of the park’s campsites. It was a rustic set up with basic facilities, from where I heard the rumble of lions in the distance – making a nighttime visit to use the facilities all the more interesting. Samburu, though popular, does not enjoy the fame – or receive the visitor numbers – of some of Kenya’s larger reserves, despite enjoying publicity in recent years from the bizarre story of a lioness that adopted an abandoned oryx calf. (Beware: this story does not have a happy ending.) Nonetheless, this is an excellent park. Its dusty thorn bush and scenic mountain backdrop represent a last frontier before the barren lands of Kenya’s north, and have quite a different character to the open plains of Masai Mara. The wildlife is also more for the connoisseur, with unusual species such as oryx, gerenuk and Grevy’s zebra found among the more standard big game. Visitors should enjoy the large elephant population and may well come across all three big cats – especially leopard. Lodges are clustered around the Ewaso Nyiro River, which is a magnet for game during the dry season and harbours numerous large crocodiles. My visit was to a cheaper tented camp, and proved very productive, with good sightings of all the local specials – including reticulated giraffe – and lions seen on every day. The birdlife was especially rich, both along the river and in the savanna, with raptors, from secretary bird to pygmy falcon, especially prolific. North of Mt Kenya, 350 kms from Nairobi and north of the Equator, the lush cool greens of the highlands tail off into arid brown. Here the Samburu National Park stretches for 165 sq kms across the part-baked desolation, broken only by the muddy green Ewaso N’giro River with its lacy fringe of tamarind, doum palms and acacia. In a harsh world on the edge of the desert, where drought is a way of life more years than not, it is a lifeline for wildlife, including many species simply not found in the southern parks. 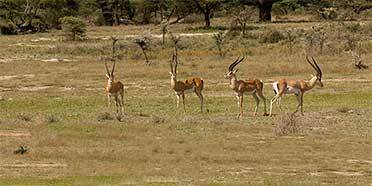 Antelope such as Grant’s gazelle and the strange giraffe-necked gerenuk survive without drinking. Grevy’s zebra, the Beisa oryx, the reticulated giraffe and Somali ostrich, whose legs go purple when excited all stalk the plains, while martial eagles and pygmy falcons circle overhead. 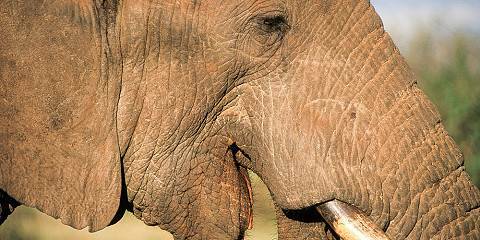 In all there are around 365 species of bird and all the main species of mammal, except rhino which have sadly succumbed to heavy poaching. The local Samburu people are relatives of the Maasai and equally colourful, with their ochred hair and beaded dress. The chance to visit their villages and learn something of their lifestyle adds a wonderfully rich new dimension to the safari. When I first visited Kenya some twenty years ago Samburu National Reserve, and the surrounding areas, had a bad reputation for banditry and general lawlessness and this made Samburu something of a last frontier in Kenyan safari tourism. Today, things have changed dramatically, but even though the reserve is now firmly on the mainstream safari circuit it’s still much less visited than say Amboseli and this gives it more of raw and wild feel. With its new take on otherwise familiar species (think Somali ostrich with their smartie blue legs and tightly-striped Grevy’s zebra) Samburu makes a perfect complement to the big ticket south Kenyan reserves. It’s also a great reserve for northern, dry country bird species. As much as the wildlife what I like about this park and its surrounds is the scenery and the cultural interest. Giraffes wandering through lobster burnt scrub and, on the edge of the reserve, tall Samburu moran their hair plaited red and adorned in feathers and flowers. With the exotica of its scenery, wildlife and people no other park in Kenya gives me such butterflies of excitement. Kenya has a number of world-famous parks, which can get a little congested in peak periods, but Samburu is far enough away from the busier parks to offer a slightly wilder experience. Although I had toured Kenya and the Kruger before, when we hit Samburu my travel buddies were on their first safari – and what a safari it was. A lion pride almost numbering in double digits chowing down on a very recently slain oryx, a herd of elephants bathing in the muddy river and an encounter that was a little too close with a vervet monkey as we lunched alongside the river. Samburu National Reserve is arid country, gnarled and broken trees, thorny acacia, roads crying out to be graded, a parched landscape crying out for rain. The reserve has a reputation for great wildlife watching. Unfortunately, while I was there, pastoralists from the local area had brought their cattle into the reserve. They were well armed and not about to let a bunch of park rangers kick them out – the reserve has abundant water and grazing for their cattle and there hadn’t been much rain around in northern Kenya. This invasion of domesticated animals disrupted the local wildlife and viewing was poor while I was in the reserve. We drove around for hours and saw a few skittish dik-dik, some elephants, the odd-looking gerenuk, a lone giraffe, but it was not until the end of my stay that we spotted what the park is famed for – leopard. We had some good viewing time stalking a male leopard lazily strolling around some boulders looking for the perfect place to catch some late afternoon sun. About 10 other safari vehicles also had the same experience, taking some of the joy out of my prized moment in Samburu. If the pastoralists have moved out, the wildlife watching will no doubt be vastly improved, it’s worth checking with your tour operator.